Lazy Saturday Bkst @ The Big Tree Restaurant. 6 weeks. Yep, I haven't been as diligent as I thought I would be for the last few weeks since arriving in Bangkok. But what a crazy and busy 6 weeks it has been. It feels like things are finally starting to calm down and a semblance of normalcy is reasserting itself into my daily existence. Life is going great. I'm really loving the school where I'm working and I am so very ecstatic about my job. The living conditions are pretty good (compared to where I've been in the past.) so no real complaints there. I guess the only thing that I'd be a bit disappointed in is the overall layout of my apartment (it's a studio) but I'm taking some measures to improve that with some upgrading of my furniture and room accessories. Plus, it's a new complex, so despite it having some quirks as they iron out the bugs, the overall experience is getting better every day. So, no worries there. Flying into BKK on July 29th, 2012. Well, I finally got to Bangkok, so that I can begin the next interesting chapter that has been my life teaching internationally. 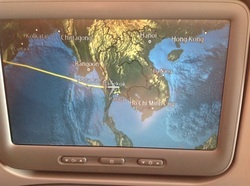 I got to Bangkok (BKK) around 1:30pm on Sunday the 29th of July. The flight was pretty rough coming out of Dubai. As we were crossing the Bay of Bengal we hit with a LOT of turbulence due to plowing thru a front of storms kicked up by the monsoon season. We were bumping, falling and surging up for about 45 minutes. Some of the jolts were quite severe, and lots of folks were getting pretty nervous you could tell. So, we finally landed and I got a chance to meet some of the folks I'll be working with this next year at TCIS. I finally met Sumon, from our Personnel department who is handling my residency and visa paperwork. She came down along with Ted, who is from our English Department and Dr. Chuck our school director. It was very welcoming to see all these folks who had taken time out of their Sunday afternoon to come down and greet me at the airport. So, Ted & Sumon took me to my new apartment and I got a chance to see where I'll be living for probably the next 2 years. I was fortunate in that I got one of only three corner single apartments that have double windows in them, so my apartment feels quite bright and airy. I'll get some pictures pretty soon. Then, after flying for over 20 hours, I took a shower and crashed. I woke up earlier that evening and managed to get outside to grab some dinner. I found a great noodle vendor just down on the street and I ordered some of his creation. For only 25 baht which is 79 cents I had a full meal that was absolutely delicious. I brought my food home, ate, unpacked a bit and then went back to sleep. All in all, it was a pretty great day overall, and a nice welcome to Bangkok. Many years ago in the mid-nineties email was a pain in the rear end. Back then whenever you changed your internet provider, your email changed, Many of my friends, as well as myself, decided to go out and purchase our own domain names so that we could have a stable email address that would never change. The most logical solutions was to get a domain name that was your last name. Remember though, back in 1996 the only domains available were .com, .net, .edu, .mil, .gov, and .org. Unfortunately my first and obvious choice of zeise.com was already in use by a German electrical motor manufacturer so that was ruled out. Zeise.net was also taken, and zeise.mil, zeise.edu and zeise.gov were unobtainable. That left me with zeise.org as my last choice, so I purchased it.